This Impressionist landscape oil painting was actually created entirely by hand (literally). I forgot my brushes and rather than go home or wait for my husband to get them, I just stayed set up and used my fingers instead for this Plein Air Painters of Chicago outing. The painting is titled "606 Skyway" and is 11x14". The scene is of the new fitness/green conservation path at Wood Street and Bloomingdale. This beachy oil painting is titled "Pink Paradise" and is 11x14. The painting is from one of my outings with the Plein Air Painters of Chicago at Foster Avenue Beach looking north from Foster Avenue. 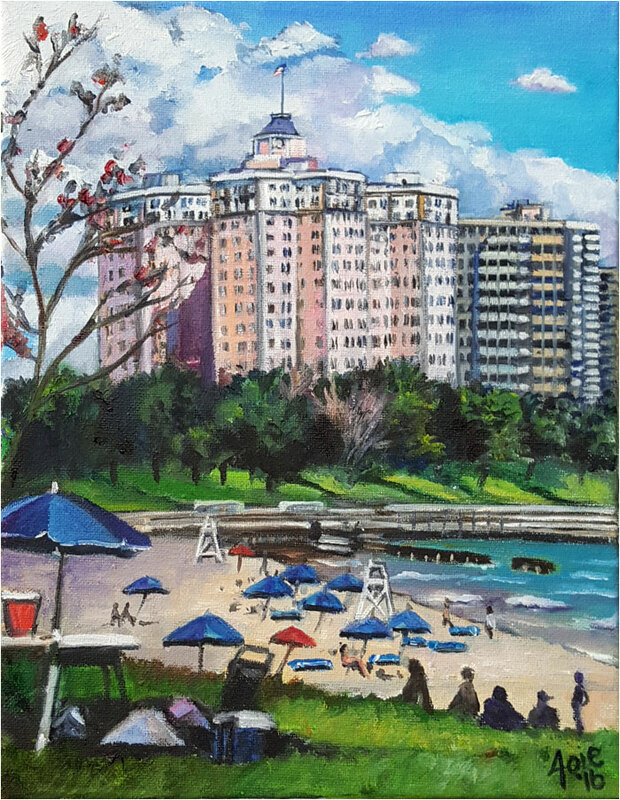 The featured building is our Pink Paradise; the Edgewater Beach Apartments (formerly the historic Edgewater Beach Hotel) which creates a lovely pop of color in the northern Chicago skyline. As a plein air artist, I sure do hope this structure continues to be preserved and does not turn into an ordinary parking lot. From Wikipedia: During its lifetime, the hotel served many famous guests including Marilyn Monroe, Frank Sinatra, Judy Garland, Charlie Chaplin, Bette Davis, Lena Horne, Tallulah Bankhead, and Nat King Cole, and U.S. Presidents Franklin D. Roosevelt and Dwight D. Eisenhower. The hotel was known for hosting big bands such as those of Benny Goodman, Tommy Dorsey, Glenn Miller, Artie Shaw, Xavier Cugat, and Wayne King, which were also broadcast on the hotel's own radio station, a precursor to WGN with the call letters WEBH. In the winter months the bands played in the Marine Dining Room and, in the summer months, outdoors on the marble-tiled Beach Walk. On the first floor of the hotel, guests walked on a wooden gangway into the Yacht Club for cocktails. In the early days women were not permitted to sit at the bar. Copyright 2015 Joy Appenzeller Bauer, Skokie, Illinois.